About "KJV Large Print Life Application Study Bible Indexed Black Vintage Ivory Floral Tutone (Red Letter Edition)"
:The Life Application Study Bible is today's #1?selling study Bible. The notes not only explain difficult passages and give information on Bible life and times but also go a step further to show you how to ?take it personally,? speaking to every situation and circumstance of your life! This is the one Bible resource that incorporates today's top scholarship in answering your real-life questions. It includes nearly 10,000 Life Application notes and features designed to help readers apply God's truth to everyday life. 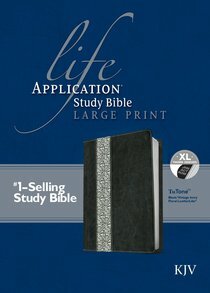 This large print edition of the Life Application Study Bible offers the King James Version along with thousands of Life Application notes to challenge readers to apply the truths of Scripture to everyday life. The Bible includes book introductions, in-text maps and charts, personality profiles, and a topical index.